The following article is from the Pacific Northwest Golf Association, who inducted Macan into their Hall of Fame in 1989. 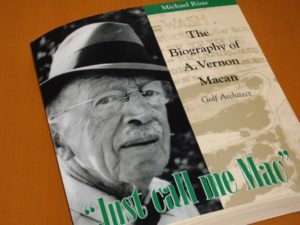 Every now and then, a personality emerges with such passion and conviction that he warrants being called a “renaissance man.” In Northwest golf circles, Arthur Vernon Macan was truly a renaissance man. Though he had considerable skills as a tournament golfer, Macan is best known for his brilliant golf course designs. Macan was born in Ireland. His eponymously-named father graduated from Dublin’s Trinity College with a degree in medicine in 1868. While serving in the Prussian Army as a field doctor, Macan Sr. learned advanced surgical techniques that would later earn him knighthood in 1908. After being named the head physician at Rotundra Hospital, Dr. Macan instituted Listerian (antiseptic) principles to the practice of midwifery that resulted in an immediate decrease in the birthing mortality rate. Unfortunately, these patient-care standards were not in place in 1887, when his wife died while giving birth to Dr. Macan’s namesake. While growing up in a well-to-do Dublin – though sadly motherless – family, Arthur Vernon Macan Jr. attended Shrewsbury, one of England’s foremost private boys’ schools. Macan was exposed to golf around the age of nine, probably at Shrewsbury Golf Club near his school. “Mac” enrolled at Trinity in 1900. But instead of tracing his father’s medical footsteps, he became a lawyer. As a member of Greystones Golf Club in 1910, Macan met Juliet Richards, the daughter of a wealthy Dublin lawyer. The two married in December 1911. With a secure position in one of Dublin’s leading law firms, a well-known father and a wife from a prestigious family, Arthur appeared set for life. He was successful in golf as well, playing on Trinity’s golf teams and competing in the British and Irish Amateurs. Between 1905 and 1912, the year he left Ireland, Macan was among the country’s top-five players. But Mac had no heart for law. He loved golf. Seeking a change of scenery and profession, the stubborn Irishman uprooted his family and moved to Victoria in the fall of 1912. Macan immediately made his presence felt by winning the B.C. Men’s Amateur at his new home course, Victoria Golf Club. 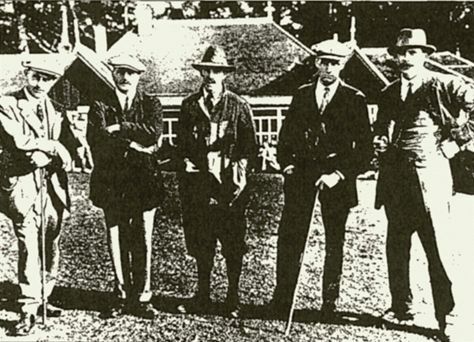 His fellow members wanted to see how the new arrival would fare against other top Northwest golfers, so Macan entered his first regional American competition, the 1913 PNGA Men’s Amateur Championship at Butte Country Club. The townspeople of Butte, then one of the West’s largest cities, were eager to host the championship. Reflecting that excitement, the Butte Miner had a metaphorical field day. Macan and a fellow Irishman, J.S. Matterson (nicknamed “McGinty”), did not disappoint. Their sterling play in qualifying found McGinty leading the field at 164, R. Barker, the reigning Montana champion, at 166, and Macan next at 168. McGinty lost, so Barker and Macan met in the final, with Macan romping 5 & 4. Macan presented his daughter with the new PNGA trophy on her first birthday, May 29, 1913. “One of the most remarkable performances of the day was made by Jack Neville of the Claremont Country Club in San Francisco, who has been the Champion of Northern California for the past two years. Neville established a new course record for the revised course, completing the 18 holes in the morning round with a 70. The last championship in which Macan participated prior to serving overseas in the military was the 1915 PNGA Men’s Amateur Championship at Tacoma Country & Golf Club, where he was eliminated in the second round by another Californian, Robin Hayne. 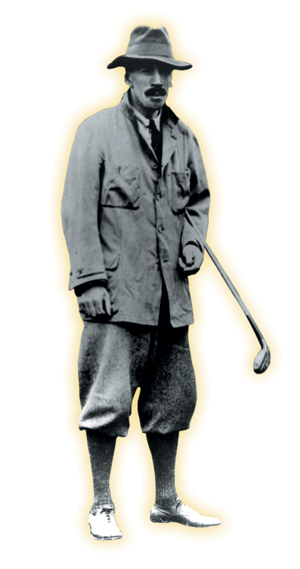 Had it not been for the first World War, Macan’s golfing prowess could have equaled the other stars of the 1920’s. But Macan lost his left foot in the Battle for Vimy Ridge. While recovering in a London hospital, he wrote letters to his golfing buddies in Victoria, promising he’d continue to play competitive golf. Upon returning home in 1920, Macan’s prophecy proved mostly true. For the next three years he was a medalist, semifinalist or finalist in the B.C. Men’s Amateurs and/or PNGA Men’s Amateur Championships. Amazingly, Mac’s wooden left foot caused his handicap to increase only from four to six. The disability hastened Macan’s move from playing golf to designing golf courses. Macan – like Alister MacKenzie, Donald Ross and the more famous East Coast designers – saw potential in a field that had traditionally lacked refinement and artistic skill. Many of the penal-type golf courses in vogue before the 1920’s were created by local golf professionals or the area’s best players. Little thought was given to the routing of holes or the placement of hazards, which were positioned mainly to inflict damage on errant shotmakers. Macan, MacKenzie and the like changed all that. Macan based his philosophy of golf architecture on John Low’s 1902 book, Concerning Golf, which promoted the idea that players should think their way through a round. Low’s book had 10 principles of strategic design, which Macan adamantly followed throughout his career. His resolve was so firm that he’d turn a job down if a site did not allow the strategic rules of design. Another Macan trait was an uncanny ability to design greens with drainage suitable for the Northwest’s wet climate. His unique “herringbone” drainage systems eliminated the accumulation of water around, on and under the putting surfaces. The PNGA soon found that Macan courses were ideal for its championships. In the 1920’s, 12 clubs had joined the original five clubs in the championship rota. Eight of these courses – Columbia-Edgewater and Alderwood (now obsolete) in Portland, Fircrest in Tacoma, Broadmoor and lnglewood in Seattle, Royal Colwood in Victoria, a renovated Shaughnessy Heights in Vancouver, and Manito in Spokane – were Macan designs, and each hosted many tournaments over the years. Unfortunately, Arthur Vernon Macan died a penniless man. Perhaps due to his nature and character, or more probably because of where he chose to work, Macan’s genius is still largely underappreciated beyond the Northwest.